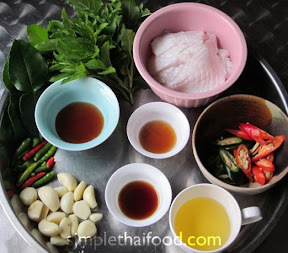 To fry something with Holy Basil is a variety of fry in Thailand. 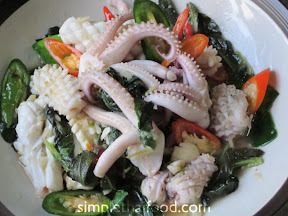 Today I have fresh Squid and I just need a quick lunch. The whole process took me not more than 15 minutes. This is a basic food where you can get from any fast food place (Aharn tam sang, food by your order) to any restaurant in Thailand. I love the spiciness of the chili mix with the aroma of basil leaves and lime leaves. This is what I miss most when I was on overseas trips. You can top this fry on the rice or you can cook it for a share plate for a dinner. This is very easy, quick and tasty. Mix the small chili with the garlic in Mortar and beat into paste. Heat the cooking oil in the wok and add the paste, when you smell the aroma, add the clean squid, follow by the shred lime leave. Season with Fish Sauce, Soya Sauce and Oyster sauce. Add the slice Chili for brighter color. Check the final taste, if you are satisfied add the holy basil and turn off the gas.